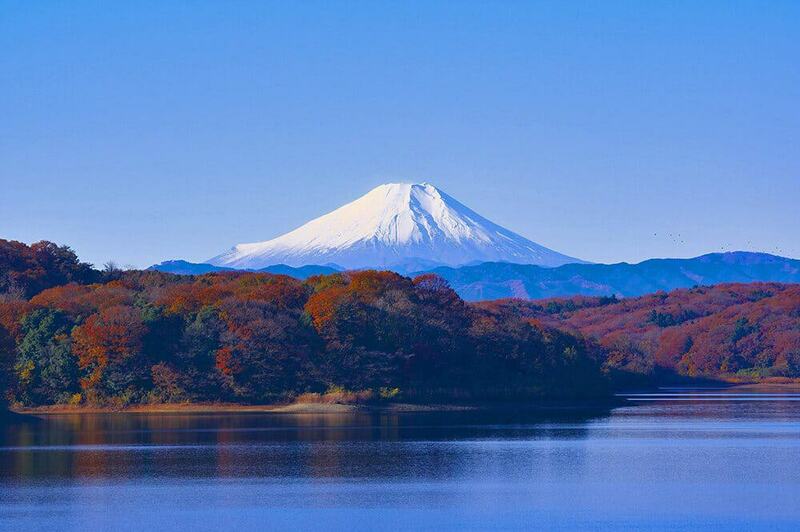 The best seasons to visit Japan are Spring and Autumn… but Winter is also full of surprises! A while ago we decided we were traveling to Japan for the first time. 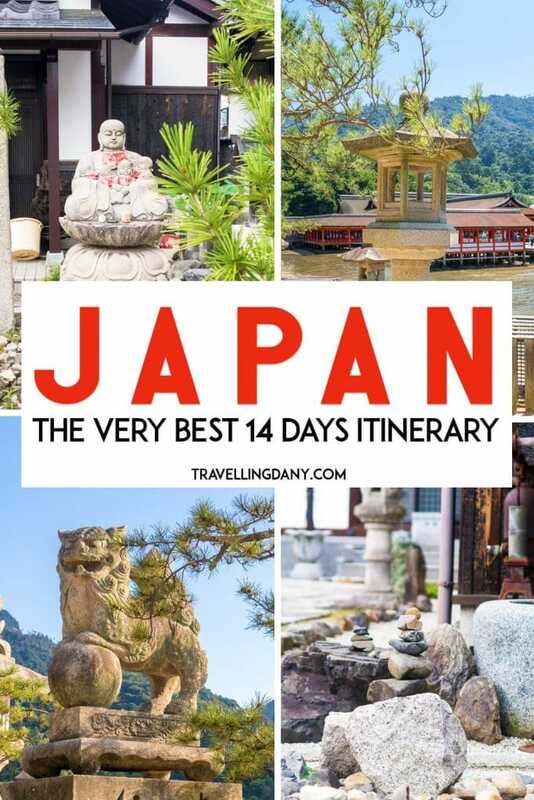 When trying to come up with a 14 day Japan itinerary, we asked ourselves what we wanted to see. Naively, the answer was… everything, of course! The worst part of our trip was having to cut off several destinations from our Japan itinerary because we didn’t have enough time. When planning your first trip to Japan in fact you won’t have to forget to take into account travel time from one city to another! That’s why we decided to share our itinerary: it will be helpful in case you’re planning a trip to Japan! 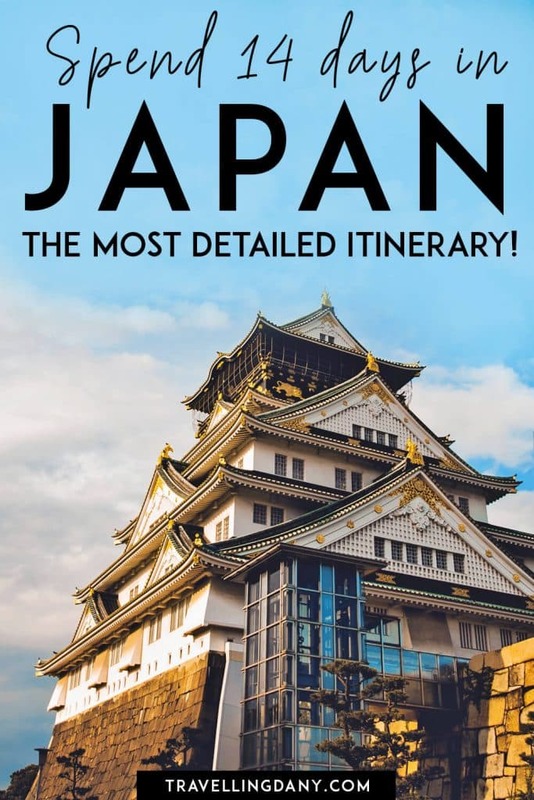 Take it as a sample Japan itinerary if you want, but for us it was a lovely trip and while there are still things we haven’t been able to see, it covered all the basis for the first timers! Let’s have a look! Tokyo is a huge metropolis and seeing “absolutely everything” is mostly impossible, unless you plan to stay there for the whole 14 days. We opted to spend 5 days in Tokyo to see at least the bare minimum. While the public transport is absolutely amazing, it still takes time to get from point A to point B. For this trip I suggest you buy a Japan Rail Pass 14 days, as most of the transport fees are covered and you will be able to save a lot of money. The Japan Rail Pass will also let you access all the huge metro stations in Tokyo, which means cutting off on the walking. Your feet will thank you! We choose to lodge in Shibuya because it is central, and because we were looking for a place where we could just walk around to do some shopping or dining, without having to take yet another metro. This district is pretty huge, lively and full of restaurants, tea houses or malls. So as soon as we landed in Tokyo, we just walked to the JR ticket counter and took a ticket for the Narita Express (included in your JRP). It arrives straight to Shibuya, so all we had to do was leave our luggage to the hotel and start exploring. In Shibuya on your first day (or the following morning if you’re too tired) I suggest you go to the Hachiko statue, which is basically next to the famous Shibuya crossing. There are also many contemporary art galleries in the area, but if you don’t have enough time, you’ll have to skip those. The Malls in the area stay open until late, and while we were there we often stumbled upon street concerts (free), dance shows (free) and other very nice pop-up events. While looking for a restaurant, make sure to walk to the Love Hotel Hill at Shibuya. The area is very safe and full of colorful hotels. Even if it’s a red lights district, you’re still in Japan, one of the safest Countries ever, so don’t be afraid to explore! Meiji Jingu was our favorite shrine in Tokyo: it’s also one of the less crowded! Our second day in Tokyo started with a thorough exploration of Senso-ji Temple. Make sure to get there very early in the morning, because it can get quite crowded! Your reward will be something delicious you can have for breakfast at Nakamise, the long shopping street that leads from the Main gate to the temple’s second gate, Hozomon. If you cross the street from the Asakusa station (Ginza Line) you will find the Asakusa Culture Tourist Information Center. The entrance is free and from the observation deck you can take amazing pictures of the Tokyo Skytree and of Nakamise seen from above. Yet our Tokyo itinerary absolutely had to include also a visit to the Tokyo National Museum (we’re proud history nerds!). This is a must see, especially if you want to learn more about Japanese history, culture and traditions. They have amazing kimonos on display, samurai armours, katanas and a section on kabuki theatre! Visiting such a big museum requires some time. You will probably spend quite a few hours inside, and you might want to relax and have fun when you’re finished. 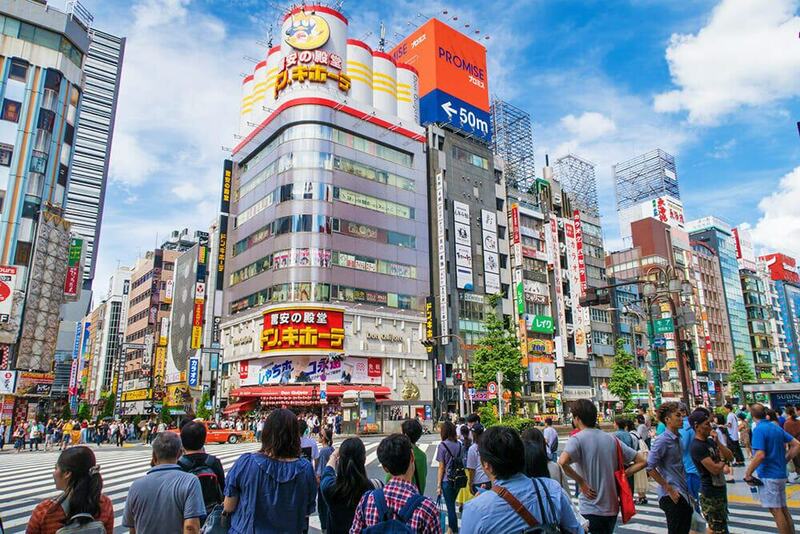 So take a train ride to Akihabara, the “nerd district” in Tokyo! You will find plenty of cheap street food, malls and huge buildings dedicated exclusively to video gaming. In Akihabara we found some of the best souvenirs from Japan we’ve brought home! 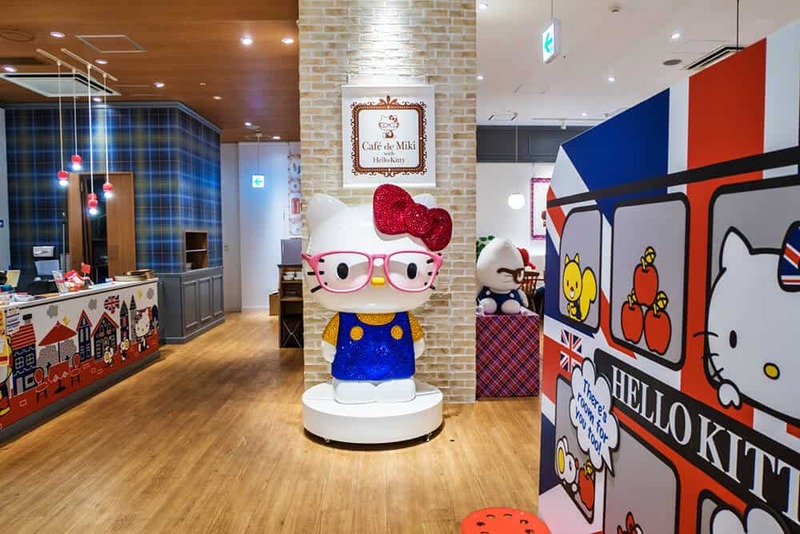 The Hello Kitty Cafè (Cafe de Miki) at Odaiba is the cutest thing ever!!! Your Tokyo travel itinerary will have you spending your third day in Japan at Odaiba. This artificial island in Tokyo Bay is one huge entertainment district! 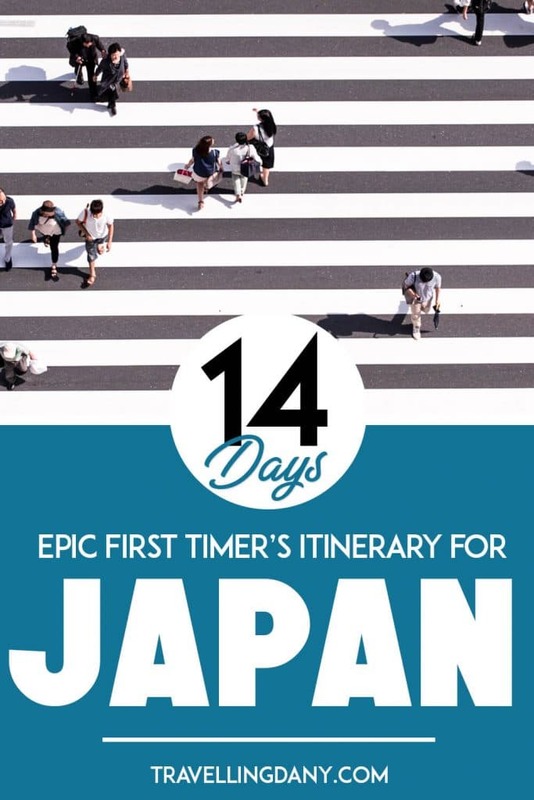 You can easily get there using your JRP (which is why I suggest you buy the Japan Rail Pass 14 days, as we used ours from the moment we landed in Tokyo to when we left Japan, as it also covered the costs to get to and from the airport). It should take you about one hour, but it really depends on where you are lodging. Odaiba is a lot of fun but you will also walk a lot: we were so taken with the whole thing that we never realized. Our feet reminded us that we had overdone it only when we returned to our hotel in the evening… ouch! So talking out of experience, I suggest you take it easy. There are so many fun things to do in Odaiba, but make sure you go see the huge RX-0 Gundam Unicorn that guards the entrance to Diver City Tokyo Plaza (a huge mall). Every 30 minutes this “life size” robot statue will come alive for a free show that transforms its armour. At Diver City Tokyo Plaza take your time to explore all the shops. You can opt for a nice breakfast at the “Hello Kitty Cafe” (Cafe de Miki) or have lunch at one of the many restaurants. Whatever you choose, don’t forget to sit down and relax! At Odaiba there are many theme parks like Legoland Discovery Center and Tokyo Joypolis, but you will also find Sony Explora Science, dedicated to science and technology, the Toyota Mega Web showcase (free entrance) and Venus Fort, which is also known as the “dog paradise” shopping center. It is impossible to see everything in one day, so take note of the things you want to see and take into account that the malls are so huge that it takes some time to walk from one to the other! We added the Meiji Jingu shrine and Yoyogi park to our Tokyo itinerary, making sure we went there on a Sunday. Yoyogi park is in fact one of the places where you might see lots of “loli girls” and cosplayers. They will be more than happy to pose for you! This is one of the best locations in Tokyo also to enjoy the cherry blossoms season in Japan. 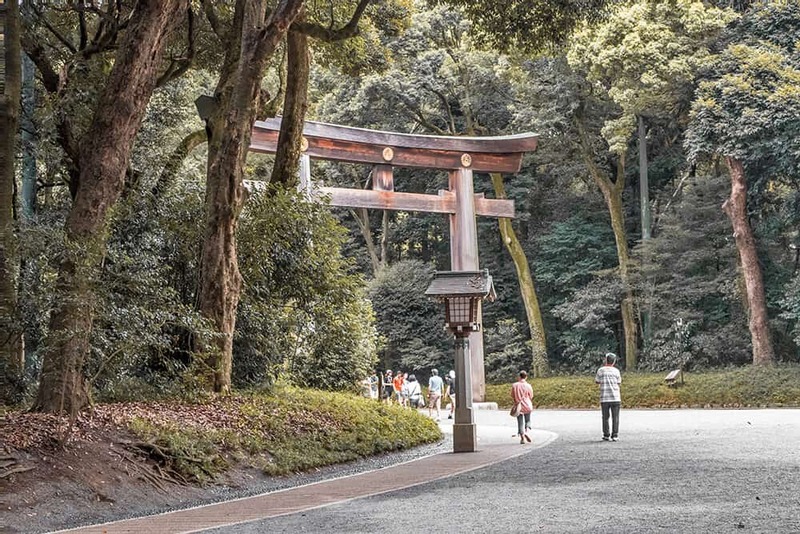 The Meiji Jingu shrine is our favorite shrine in Tokyo: so much beauty! Even the Japanese Princess Ayako has married there! We were able to see a beautiful couple of newlyweds wearing traditional wedding kimonos. In case you have the same luck, make sure not to disturb them and be discreet while taking pictures. Would you like it if random strangers harassed you for a picture on the most important day of your life? The closest station to Meiji Jingu is Harajuku on the JR Yamanote line (ride included in the JRP! ), just a few steps away from the entrance to the shrine. After having takoyaki (Japanese octopus balls) at Yoyogi park we spent the rest of the afternoon exploring Shinjuku, yet another district full of malls, colorful shops and lots of street food. Here you will find the famous Hotel Gracery with the huge Godzilla head, and if you have time, there’s also a lovely Samurai Museum that will let you try helmets and Japanese kimonos. We were dead tired, so we decided to spend our evening singing at a Japanese karaoke: we’ve never laughed that much! On our last day in Tokyo we were meant to visit the Ghibli Museum, created by director and animator Hayao Miyazaki. Unfortunately tickets were sold out months before our trip. If you intend to go, keep a flexible schedule on your Tokyo itinerary, to make sure you will be available to go to the museum if you find a ticket. 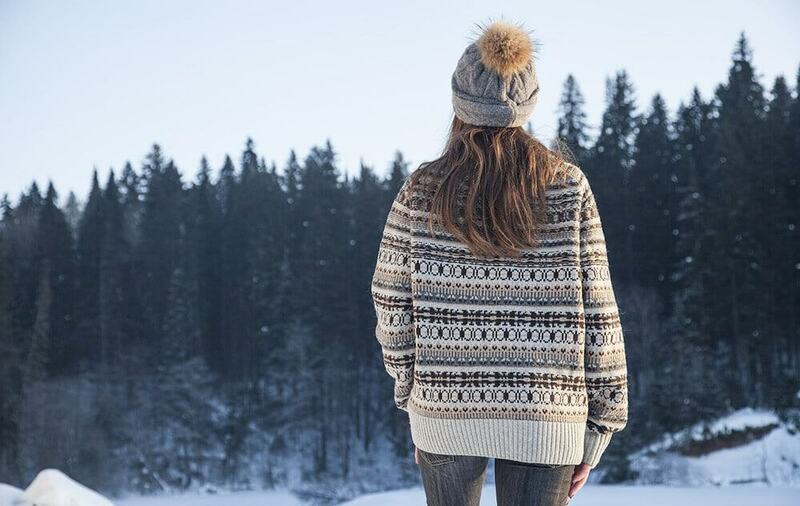 They start selling them 3 months in advance, and you should find an authorized travel agency in your Country to buy them, or get them online at an official reseller. If you aren’t lucky enough to grab your tickets for Ghibli Museum, unless you want to get back to Odaiba for some more fun, you could visit Roppongi Hills in Tokyo. It’s one of the largest integrated property developments in Japan. 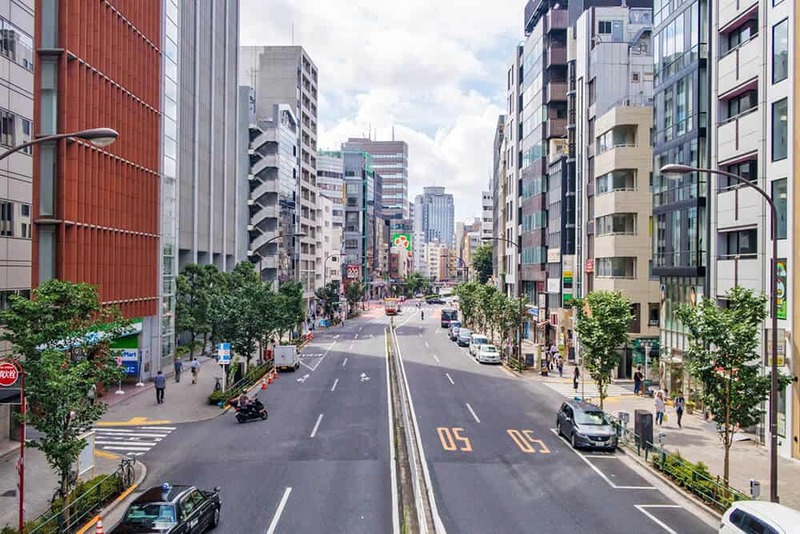 Located in Minato, it has been celebrated also in the Amazon Prime Video series “Tokyo Girl“, about the struggle of a girl who moves to Tokyo from the countryside to follow her dreams. Here you can find my detailed Tokyo itinerary for 5 days with all the info (tickets, times, prices and public transport)! Our 14 days in Japan were going wonderfully. We were to go from Tokyo to the ancient town of Takayama, in the mountainous Hida region of Gifu Prefecture. Takayama has a beautifully preserved old town, and we had been reading wonderful things about it. Unfortunately while we were in Tokyo, heavy rain caused extensive damages in wide areas of Japan. We weren’t worried, because we knew that in Japan everything works smoothly, but the situation was very dangerous. With 119 dead, 81 missing and more than 23,000 evacuated because of landslides and floods, we were asked by the local authorities not to go to the Gifu Prefecture, just to be on the safe side. We’d only hamper the relief efforts: we then decided to change our destination on the move, thanks to the fact that we had a Japan Rail Pass for 14 days that covered all the transport costs. Our next destination was going to be Kanazawa. Just a short note: Takayama is perfectly ok at the moment. Everything is back to normal and it’s safe to visit this beautiful little town! 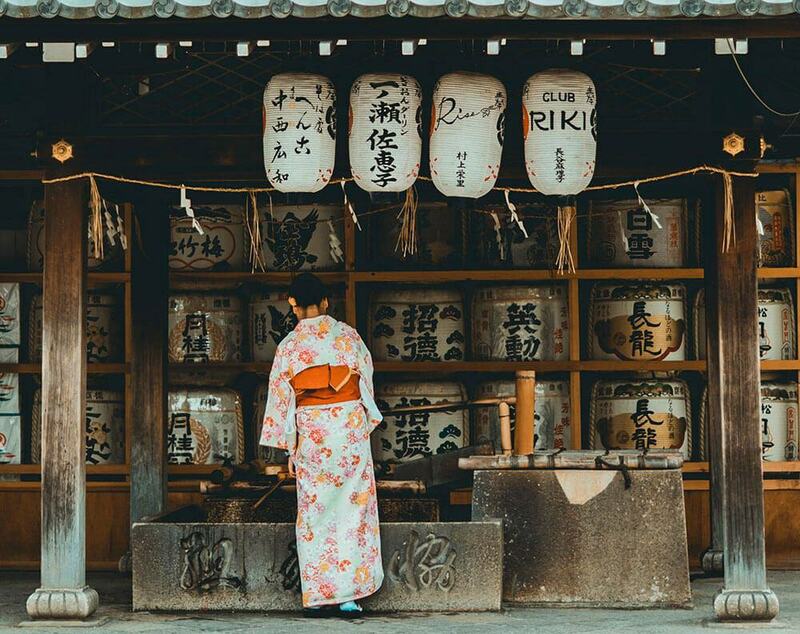 After your 5 days in Tokyo, you can decide if you want to visit Takayama or Kanazawa. For what we’ve seen, spending one day in each city would mean rushing both visits (because you have to add transport time to your itinerary) and it’d be a pity! 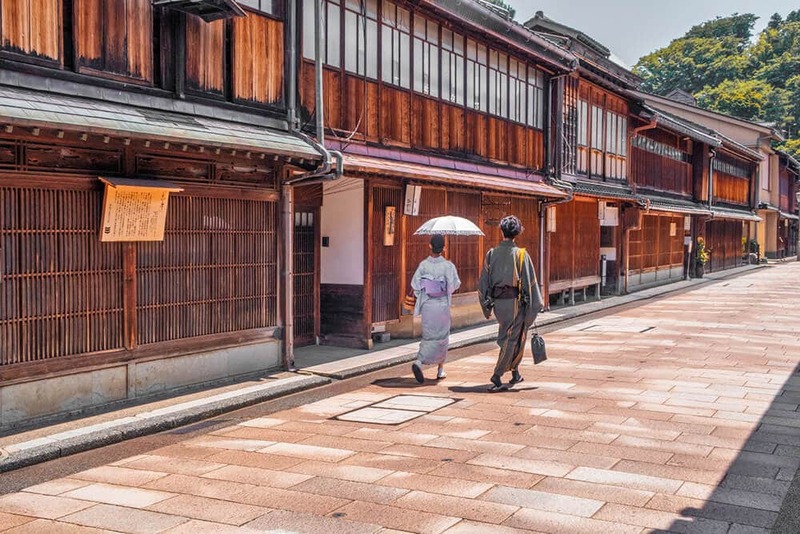 Kanazawa is a beautiful traditional city out of the beaten path in Japan. We booked a hotel near the train station, and it was a great idea. The area is in fact full of nice restaurants and shopping centers. In the evening we just walked around to find something delicious we could eat, we’d do some shopping and walked back to our hotel room. Also being close to the train station means that you’ll be able to hop on a bus right after having your breakfast at Starbucks, as the bus platforms are just a few steps away: not having to rush was such a nice change of pace! At the Kanazawa train station you will also find an info point for tourists. The staff is amazing and speaks a very good English. They were so nice and offered us a map, the bus timetable and a few suggestions on what to do and what to see in the area. Definitely rely on them if you’re in need, they will be glad to help! After leaving our luggage at the hotel, we hopped on a bus to Kanazawa Castle. Built in 1583, it was the seat of the powerful Maeda clan until the end of the Edo Period. Because we are two history nerds, we absolutely wanted to visit and weren’t disappointed! It was amazing to walk through the famous Ishigawa-mon Gate, that survived to several fires, the same gate used by the legendary samurai of Japan! If you’re visiting Japan on a budget, you can visit Kanazawa Castle Park for free and take pictures of the castle. We actually wanted to see the inside of the surviving buildings and turrets, so we paid 310 yen per person. You can enter from 9:00am to 4:00pm every day and once inside you will be asked to remove your shoes. The inside is mostly bare, but you can access the turrets and see the inside of the Gojukken Nagaya Storehouse. From Kanazawa Castle, walk over to Kenrokuen, named one of the three most beautiful zen gardens in Japan. Tickets cost 310 yen per person (actually if you go there at 5:00am you can enter for free) and you can access the gardens from 7:00am to 6:00pm from March to October 15, and from 8:00am to 5:00pm from October 16 to February. Kenrouken is full of beautiful bridges, trees, flowers, stones, viewpoints and traditional teahouses. It is a very famous spot for hanami in spring and for watching the Autumn foliage in Japan. Just outside Katsurazaka Gate you will also find lots of restaurants and shops that line the pedestrian way: they even sell the famous gold leaf wrapped ice cream! While planning a trip to Japan you need to have a flexible schedule. Because we had our Japan Rail Pass, we absolutely never worried about sudden changes to our itinerary, but still… we hadn’t really studied Kanazawa enough before to visit. So on our second day we’ve been to the info point at the train station to ask for a few pointers. The lady at the counter suggested we start by visiting the geisha and samurai districts, then we could visit the Omi-cho market for lunch. The first thing we did, just as she suggested, was to hop on a bus to get to Higashi Chaya. The ancient geisha district is absolutely amazing. Not only it’s full of traditional houses and ancient buildings, but because it was so quiet we could hear the geisha playing their shamisen in the tea houses, as we explored the area. It was like walking into a dream! At Higashi Chaya, we found the Utasu Shrine. The entrance is free and it is one of those very traditional, absolutely breathtaking small shrines almost only known to the locals. Kanazawa is a quiet little town so please, if you visit, always be respectful! Be quiet when you go to a shrine or a temple, as there are people praying. And don’t harass the geisha or maiko for pictures: they are working! Our next stop was the Naga-machi district. Here we found incredibly well preserved samurai houses from the Kaga era. It stayed exactly as it was back then, with the narrow streets, beautiful gardens and traditional buildings. 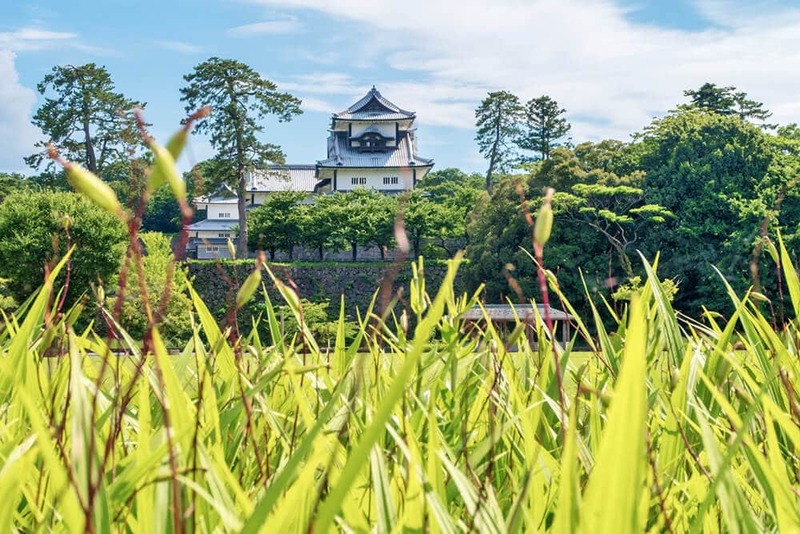 There are a lot of places where you can go to find artifacts or statues of Lord Maeda Toshiie, as well as museums or traditional samurai houses you can visit. One of the most impressive is the Nomura-ke, a restored samurai residence with a beautiful garden. The Nomura were a high ranked samurai family that went broke when Japan’s feudal era came to an end (Meiji period). The entrance costs 550 yen and it’s open from 8:30am to 5:30pm. The visit is worth the ticket if you love history and if you want to visit a real samurai house. If not, maybe you can have a look at the Kaga Hanshi, a well preserved building with a tiny garden. It was previously a stable that housed horses and the entrance is free. At Nagamachi you can also visit the Maeda Tosanokami-ke Shiryokan Museum (entrance 300 yen), where you can see a lot of art objects, letters, weapons (so many katanas!) and other things belonging to the Tosanokami family. The Utasu Shrine in Kanazawa is tiny and very beautiful: be respectful if you visit! Our Japan vacation continued to the Omi-cho market. Open from 9:00am to 5:00pm, it is one of the favorite from the locals, because there are about 170 shops full of fresh fruit, fresh fish, sushi bars and restaurants. Food was super cheap! In stead than sitting down, we decided to just walk around and eat all the little bits we liked. It was amazing to discover so many different tastes and ingredients we’d never heard about! 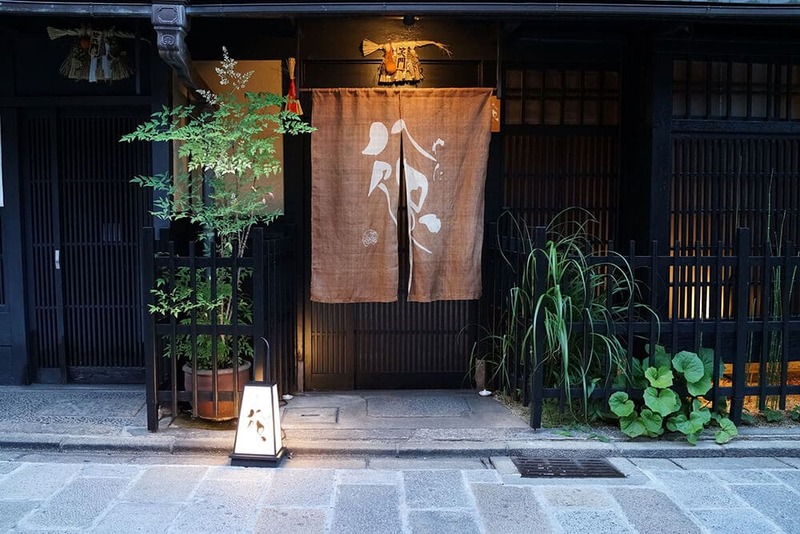 There’s one thing you must know about Kanazawa: here food is delicious wherever you go. It is the perfect foodie destination that you can add to your itinerary for 2 weeks in Japan. Even the restaurants around the train station were all amazing, we’ve been able to try many new things and finally discovered that in Japan people eat much more than sushi! In Italy in fact people tend to believe that ramen and sushi are the only things you can eat in Japan. But it’s absolutely not true! If you go to Kanazawa make it a point to eat as many delicious foods as possible! Just like we did in Kanazawa, we opted for a hotel pretty close to the train station to be able to go through our Kyoto itinerary even in just a few days. The old Imperial capital of Japan is not as big as Tokyo, but there are so many things to do and see! Which is why this was the part of our two weeks in Japan when we had to rush our visit a bit. In case you want to stay another day in Kyoto, you can probably give up on one day in Osaka! Take this as a sample Japan itinerary that you can edit according to your preferences. So, lodging around Kyoto station is the smart way to explore Kyoto if you don’t have much time. Kyoto station is an impressive building, where you will find two malls and a large number of restaurants. Just outside the train station there’s the bus station and an information point where you can ask all the info you need about the “tourist” buses for Kyoto. Look for the “Raku” buses, they have routes that cover all the main tourist attractions. At the info point they will give you a handy map with all the stops and in case you need it, you can buy a daily ticket. It’s the best way to save some money if you want to explore more of Kyoto using the bus! After leaving our luggage at the hotel, we went for the Arashiyama Bamboo grove and Tenryu-ji temple. It was still early in the morning, and we’d had breakfast on the train from Kanazawa, so we decided we would have lunch at Nishiki market, later on. Apparently it’s almost impossible not to find tourists at Arashiyama! 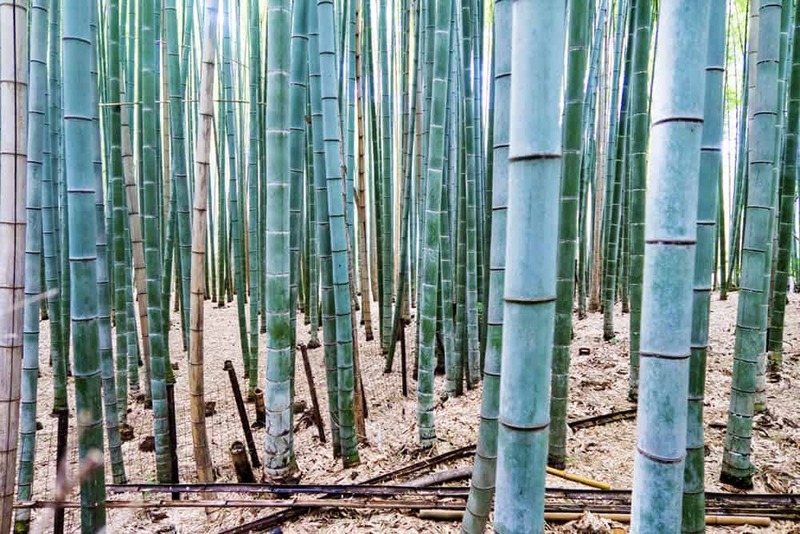 To get to the Bamboo forest you will use your Japan Rail Pass. The ticket to JR Saga Arashiyama is included. Once you’re there, visit Tenryu-ji Temple. 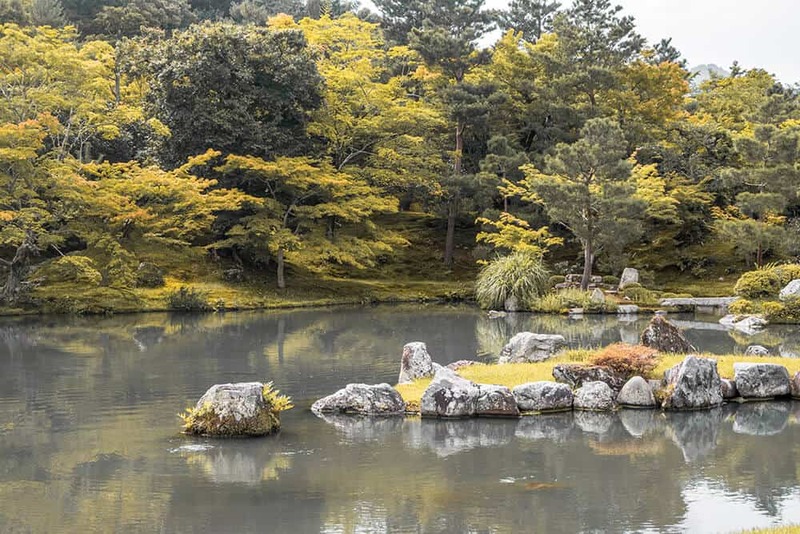 It’s a UNESCO world heritage site and has one of the most lovely landscape gardens we’ve seen in Japan! The entrance to the Arashiyama Bamboo Forest is located at the North exit from the temple, on your left. Even if it was early in the morning and in the middle of the week, we still found a little crowd already taking pictures. It is almost impossible to be alone in the forest, unfortunately! In case you have time, try to make the most out of your visit while waiting for people to walk past the part where you want to take pictures. After returning to Kyoto station, we hopped on a Raku bus to get to Nishiki Market, which is a bigger (and more crowded!) version of the Omi-cho food market in Kanazawa. Make sure to bring cash with you because most of the stalls won’t accept your credit card! Nishiki market is a good place to go if you want a good lunch without spending too much. When you go there, try the chocolate croquette! The locals absolutely love this deep fried croquette filled with chocolate, and it’s also pretty cheap! Our last stop for the day was Gion, the geisha district in Kyoto. Famous because of the book Memoirs of a Geisha, written by Arthur Golden, it is still bravely trying to fight the overtourism… but the situation is pretty difficult. So let me tell you again: try to be always respectful when you visit! On our second morning in Kyoto we hopped on the JR Nara train early in the morning. We were going to visit the first place added to our itinerary for 14 days in Japan: Nara deer park! 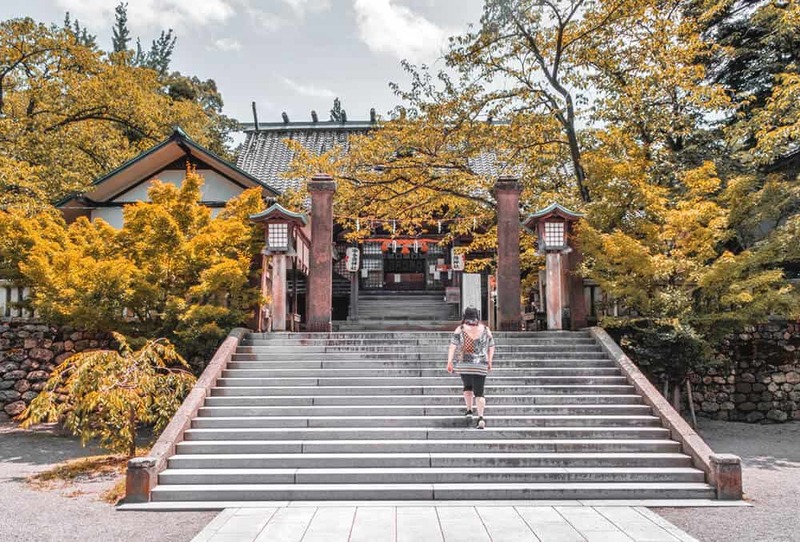 The famous Japanese park is a must see, not only because of the sacred deer, considered “National treasure“, but because of the majestic Todai-ji temple. Walking to the entrance you will be surrounded by the (even too) friendly deer: we spent some time taking pictures and petting them even if we didn’t give them no food. Once inside, we felt tiny in front of the huge Buddha Vairocana statue, flanked by two Bodhisattvas. It is 15 meters tall, located in the Daibutsuden (Big Buddha Hall), the world’s largest wooden building. The temple makes an interesting visit. Inside and outside you will find many shops selling cute souvenirs at tiny prices, so take your time to enjoy them! We had to return to Kyoto, but if you have another day here, you can also visit the Nara National Museum, Kaidanin Temple, Kofukuji or Hokkedo Hall while you’re in the area! If you’re stuck on three days like us, take the train back to Kyoto and head over to Kinkaku-ji, the Golden Pavilion. The visit is mandatory as this is one of the most celebrated temples in Japan: while you can’t visit the inside, if you love photography you won’t be disappointed. We could’ve stayed there, admiring this building covered in gold leaf for hours! In case you’re in need of an afternoon snack, here you will also find a tea house and several vending machines for snacks, drinks and ice-cream. Tenryu-ji garden is often overlooked but it deserves a visit! Our last day in Kyoto meant another early wake up call. We wanted to get to Fushimi Inari Taisha (6 minutes by train from Kyoto station) before the huge crowds. The entrance to this shrine is free, and you might have read of it already. 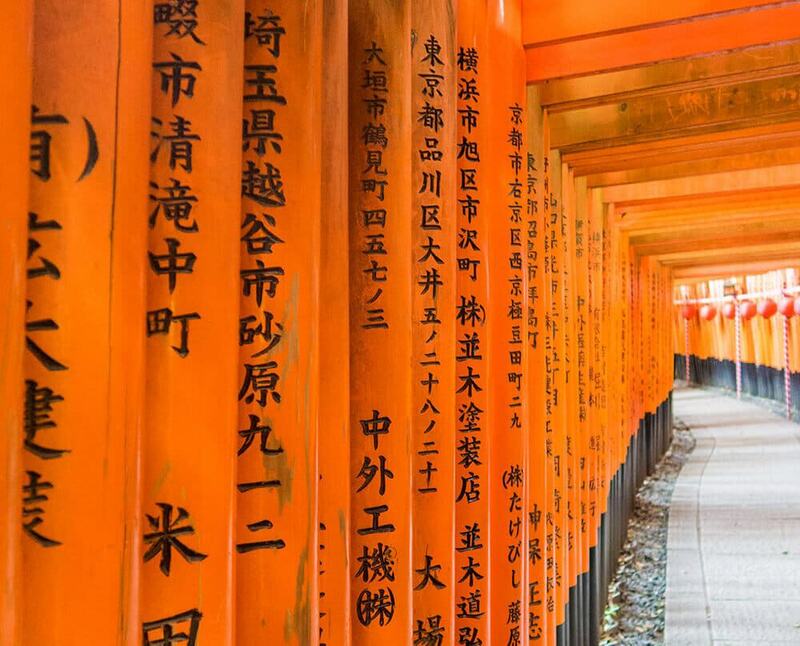 Made popular by documentaries and travel guides, Fushimi Inari Taisha is in fact the place in Japan where there are thousands of vermilion torii gates that create a long network of trails up Mount Inari. Walking to the top is surreal, especially if there aren’t many people around. The farther away you walk from the shrine, following the torii gates, the less tourists you will find. Get there early, as it’s another one of the super-crowded spots! After visiting Fushimi Inari, get back to Kyoto station and take a bus to Nijojo Castle. They have guided tours in English that are pretty expensive. But you can definitely just buy just a ticket and explore the castle on your own. It’s a majestic testimony of the Edo period, residence of the shogun Tokugawa Ieyasu. The visit will take at least one hour. Once you’re done, hop onto another bus to go to Ginkaku-Ji, the Silver Pavilion. It’s a zen temple inspired by Kinkakuji, and you should make sure not to get there too late in the afternoon. The last admission is in fact at 4:30pm. Our suggested itinerary for Japan includes a visit to the Hiroshima Peace Memorial. We believe it’s important to remember our past and the things that should never happen again. Our trips have brought us to the Auschwitz Concentration camp in Poland, to Pearl Harbour in the USA, and even to the 9/11 Museum in New York City. These visits have all been very hard on us. You walk out feeling drained, and yet we wouldn’t have it any other way: some things should never, ever be forgotten. So please, take an early train from Kyoto to Hiroshima and visit the Hiroshima Peace Memorial. You will be welcomed by the Atomic Bomb Dome, a UNESCO World Heritage Site and the only building still standing after the atomic bomb was dropped on Hiroshima in 1945 by the United States Army. Over 70,000 people were killed instantly, and another 100,000 suffered fatal injuries from the radiation. I won’t lie to you: it’s not easy to sit there, watching some of the video stories (with English subs). I cried when I watched the faces of the kids who were at school when the bomb was dropped. Many of them didn’t die immediately, but suffered terribly for days because of the radiation. No one knew what to do to help them. I also cried a lot when I saw kimonos stained with blood, shoes of a little kid, remains of the life in a city that was brutally changed forever. 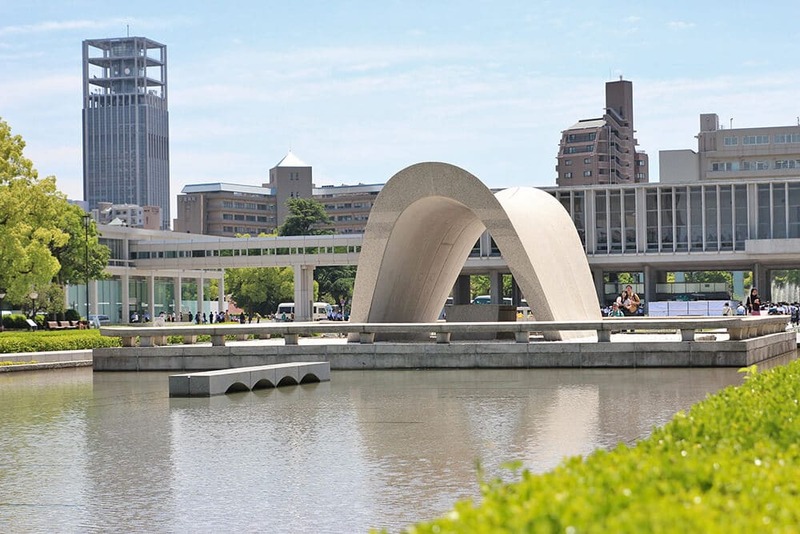 A visit to the Hiroshima Peace Memorial is absolutely mandatory! The Hiroshima Peace Memorial doesn’t blame anyone for what happened. You won’t find pointed fingers, but the hope that the world can find some peace, and that all atomic weapons be banned. Tickets cost 200 yen per person and the visit will take you 1-2 hours, according to how long you decide to stay. There are many videos describing what happened, and everything is always translated to English. Once there, stop also by the Children’s Peace Monument to commemorate Sadako Sasaki (and all the children victim of the atomic bombing), a young girl who died of leukemia from radiation. She will forever be remembered through her story. In fact she had hoped that by folding one thousand origami cranes, she’d be cured from the leukemia that was slowly killing her. While it’s popular belief that she died before she could reach her goal, at the Hiroshima Peace Memorial Museum we read that Sasaki ended up folding 1300 paper cranes before dying. After her death, and still to this day, friends and schoolmates started to fold paper cranes as well. Many Japanese schools send over their cranes every year to the museum, and they are hanging outside the Children’s Peace memorial. Try to spend the night on Miyajima island if you can: it is amazing when the tourists leave in the evening! On our 14 day Japan itinerary we absolutely had to find enough time to visit a little gem. Also known as “deer island“, Miyajima is just about 40 minutes away from Hiroshima (30 minutes by train and 10 minutes by ferry). While many people only plan it as a day trip, we decided to stay over for the night. And it was the best thing ever: we’re now smitten with this little island! Miyajima is not amazing only because of the floating torii at Itsukushima shrine. 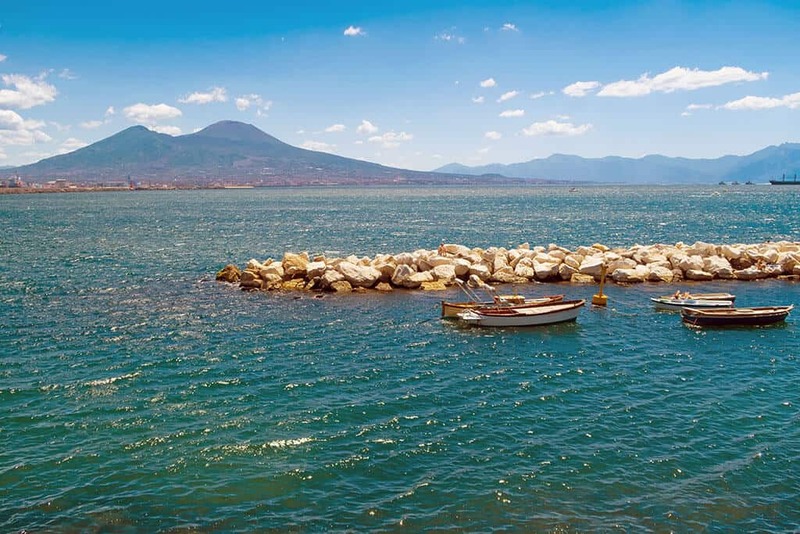 While I invite you to visit this iconic landmark, the beauty of this island lays in the locals. This is yet another foodie spot you should add to your Japan vacation, whether you’re traveling to Japan for the first time or not. Oysters and fish in general are pretty popular in Miyajima, and they are also cheap. You will find many kiosks on Omodesando and Machiya (two popular shopping streets) that sell two grilled oysters for about 400 yen. And then there are fish cakes, the popular momiji-manju (steamed sweets shaped like a maple leaf and filled with custard, chocolate or cheese), skewers… Miyajima is full of delicious surprises! The best part of the day is when the tourists slowly leave the island. Not many people stay the night, but you definitely should, to enjoy the true beauty of Miyajima. When it’s quiet, the locals like to have a chat with the tourists, after a long day at work. If you like photography like Aldo, you will definitely be happy to have stayed the night. He spent hours taking pictures of the floating torii at sunset and under the starry sky! 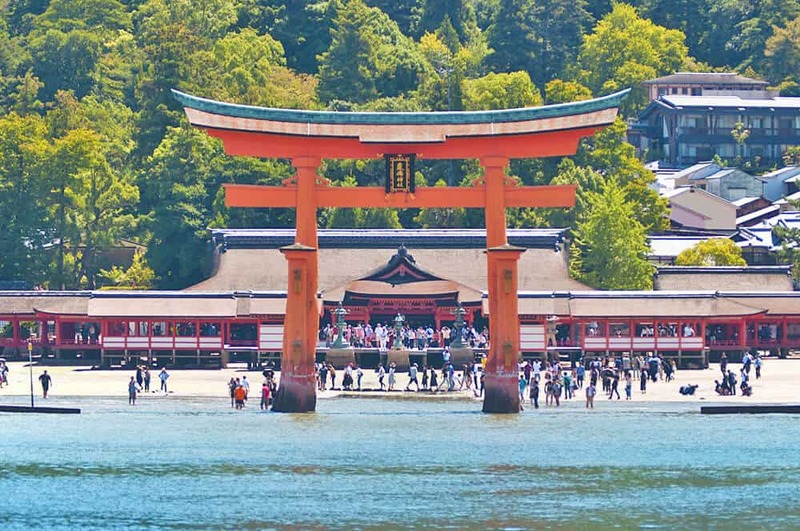 Here you can find our detailed article on all the best things to do on Miyajima island! 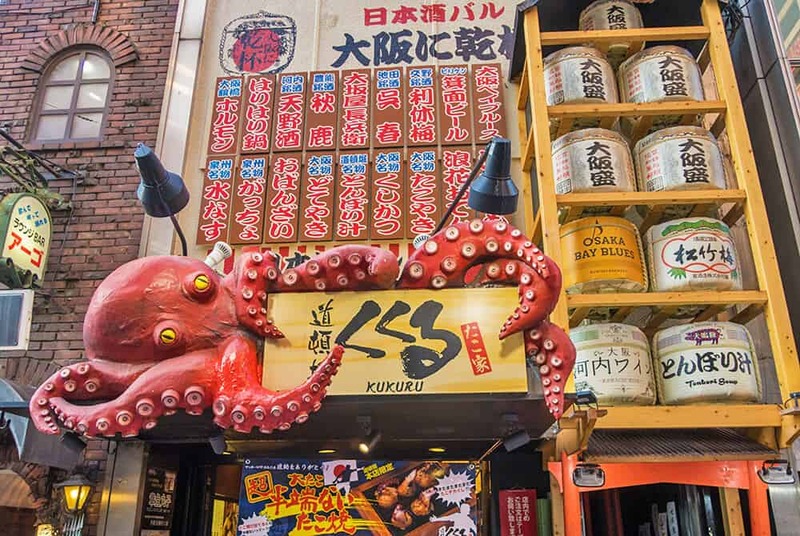 Takoyaki shops in Dotombori are marked with a giant octopus! 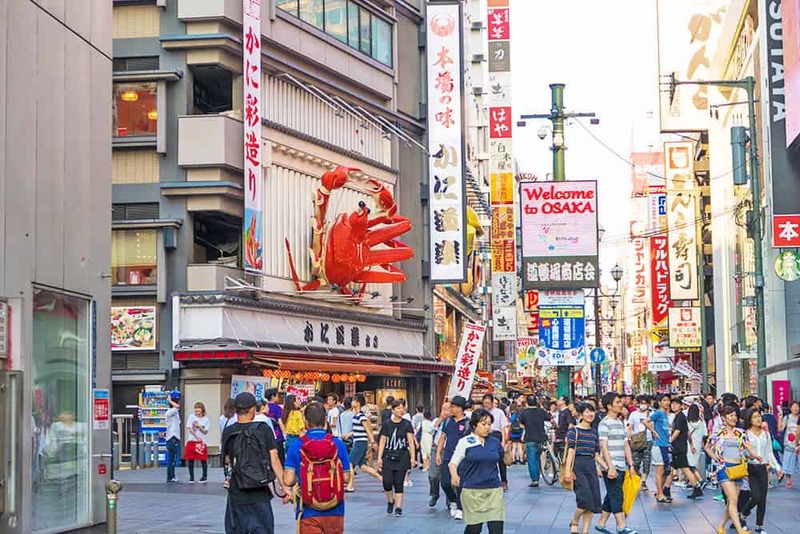 Osaka is another Japanese city famous for its food. There’s even an expression in Japan, “Osaka no kuidaore“, that addresses the Osaka habit of eating until you drop… or go broke! It took us about 3 hours to go from Miyajima to Osaka, and for once we decided not to overdo it: we’d really gone over the top in Kyoto and by the end of our 2 weeks in Japan we needed to rest! What we still didn’t know is that Osaka is a city where fun and good food are basically everywhere. We ended up going to Dotonbori, basically some sort of Japanese Las Vegas: this district is in fact renowned for its gaudy neon lights, extravagant signage and the huge number of restaurants and bars… Just like Vegas! You might have seen pictures of the famous Kani Douraku restaurant in Dotonbori, with a giant crab at the entrance. Well, that was the first sign that we were in for a night filled with fun and games. While we love planning, sometimes… things go on their own. And that’s when you have the most fun! The giant crab at Kani Douraku in Dotombori! Dotonbori is also famous for being some kind of gastronomic wonderland. Not only for the restaurants that are marked with these huge (and sometimes weird) signs, but also for all the street food stalls. In one amazing night we got to eat some of the most famous foods in Osaka. First of all the classic Osaka snack: Takoyaki. We were lucky enough to see how these dumplings filled with sliced octopus are made: just follow the huge octopus signs! Then, after playing lots of games at a couple of arcades (I swear I didn’t hear that level of noise even in Las Vegas), we went for some Kushikatsu, skewed kebabs of meat (they can be seafood or vegetables), breaded and deep fried. You can find some delicious ones at Kushikatsu Daruma. Of course I spent lots of time shopping until late at night at Tsutaya (but hey, you know me, even whenever I visit Milan I somehow turn into a shopping-maniac!). But I wasn’t the only one! Aldo explored a 7-story home electronics store, Bic Camera (Namba branch). I swear he visited every floor and also tried several items: electronics are his kryptonite! We were meant to visit yet another electronics district, Den-Den Town, but it was very late at night and we were hungry. So we decided to share an okonomiyaki (Japanese savory pancake) and go to bed. Mind you: we were out until very late, but Osaka is a city that never sleeps. And we always felt very safe! 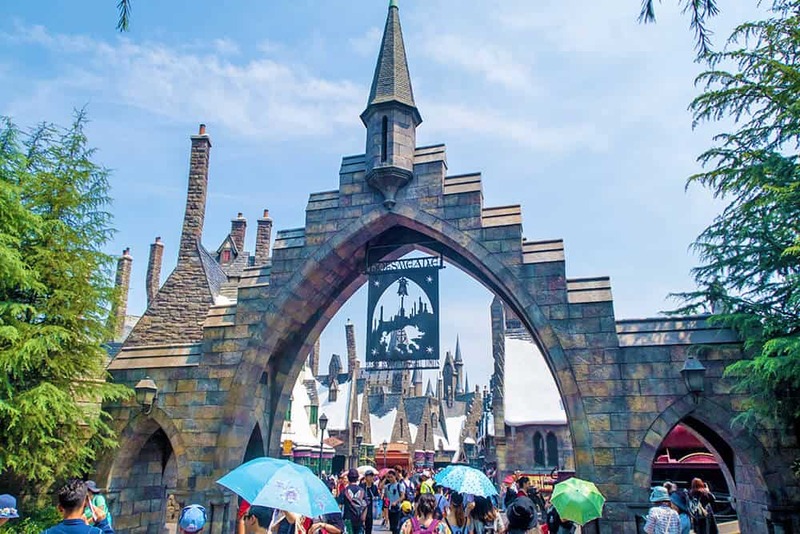 If you have one more night in Osaka and would like to spend it at a very cool theme park that mixes the Japanese and American culture, then by all means, head over to Universal Studios Japan. 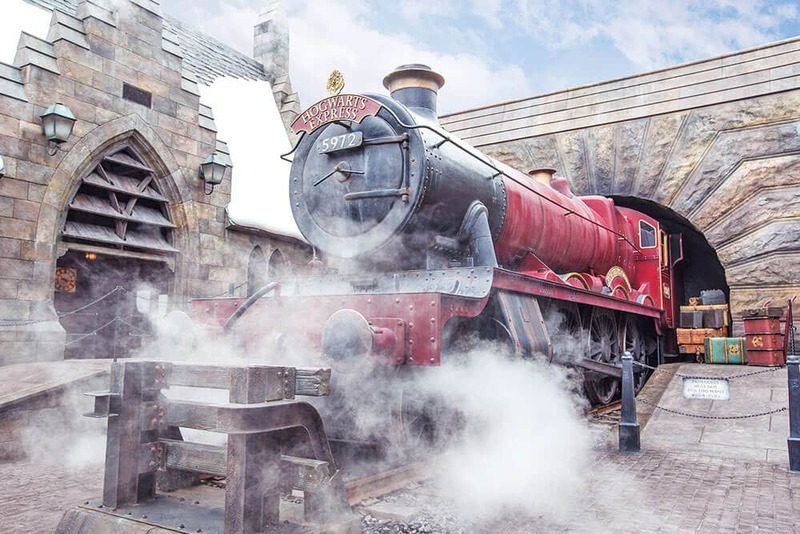 Their Harry Potter area is one of the biggest ones in the world and it’s just one train ride away from Osaka city center. If you have a Japan Rail Pass, the train ride is included! The Wizarding World of Harry Potter at Universal Studios Japan is absolutely amazing!!! Get ready to eat some delicious food! Wow! This is very detailed. Thank you for creating this. Looks like such an amazing time. I’m very glad you found it useful! Enjoy your trip to Japan!! !